I started designing this aerial photography rig at Christmas when I got access to one of the MakerBot Replicator 3D printers that were donated to Public Lab. Today I put the files for a very solid version of the Redstone Rig at Thingiverse, and I hope some people will make prints of the parts and try it out. The Redstone Rig in mapping mode with full protective bumpers. 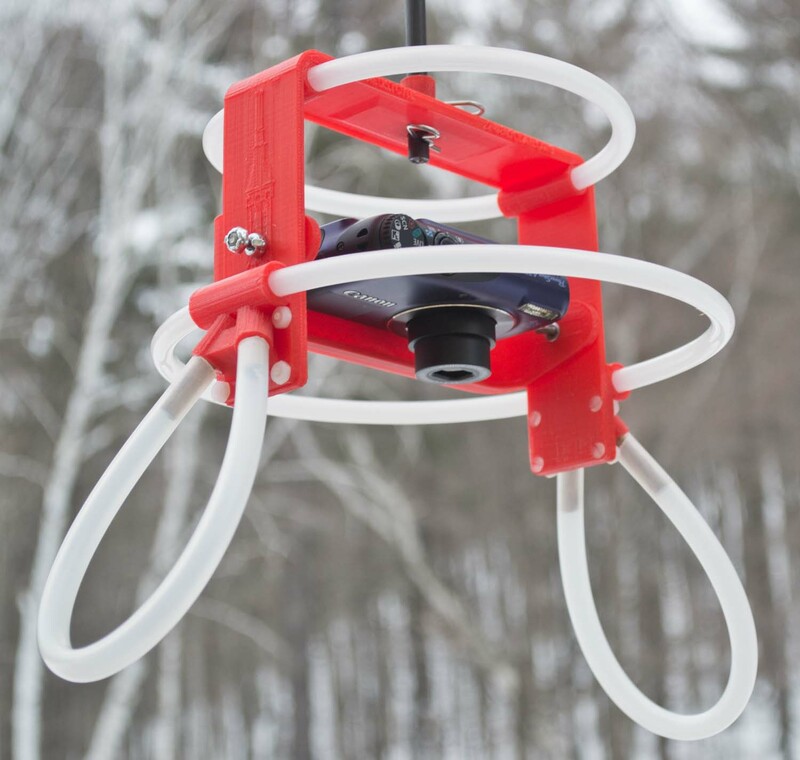 The defining tool of Public Lab is the balloon mapping kit which has been distributed around the world to hundreds of communities. I think the most transformative component of this kit is the directive to make your own camera rig out of a plastic soda bottle. 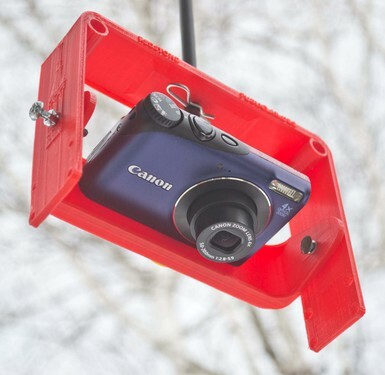 Jeff Warren’s ingenious concept of using a free, recycled, lightweight, and ubiquitous article to make a protective cradle for the flying camera has made it possible for many communities to make detailed maps their neighborhoods for the first time. The Redstone Rig in bare bones mapping mode. With no legs or bumpers the rig weighs only 94 grams. Now that the soda bottle is part of the aerial mapping culture, I thought it might be time to introduce a modest upgrade in flying camera technology. A limitation of the soda bottle rig is that when the camera is secure inside it, the camera controls and LCD are really hard to access. This makes last minute confirmation of correct operation difficult, so it takes some practice to avoid blurry or poorly exposed photos. The standard method of attaching the rig to the flying line with a string allows the rig to spin, sometimes adding to the blur. It also takes some practice to secure the camera so it can’t shift and record photos of mostly the inside of the bottle. The Redstone Rig in oblique photography mode with one and a half protective bumpers and oak legs. 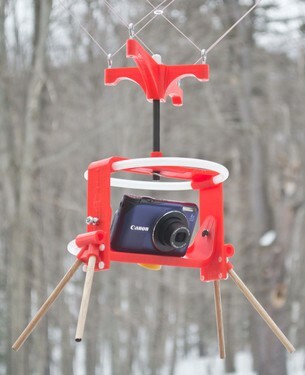 The MakerBot 3D printer seemed to offer the perfect route to an upgraded camera rig. If a more sophisticated rig could be designed, anybody with access to a 3D printer could get one. If the design evolved, new versions could quickly replace the old ones. The maximum size of printable objects, about 22 x 14 x 15 cm (9 x 6 x 6 inches), was perfect for the task, and plastic was lightweight and cheap. I thought the era of the soda bottle rig was ending. After about a month of printing prototypes, I realized that the plastic filament used by the printer is not really all that cheap. Some real hardware is used to hold the Redstone Rig together and deploy it, adding to the cost. Printing is slow -- it takes most of a day to print all the parts of the Redstone Rig -- so producing lots of them is not going to happen quickly. The Redstone Rig is heavier than a soda bottle. And of course it will also take time before very many people have access to a 3D printer. 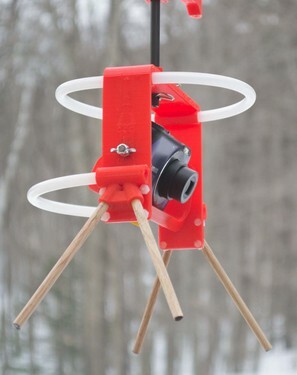 So the soda bottle rig will continue to allow lots of people to make aerial maps when they need them. I am not sure what niche the Redstone Rig will fill, but maybe some will find it useful. The parts of the Redstone Rig were designed in Sketchup. Although the Redstone places some barriers between communities and their ability to make maps, it has some features that could substantially improve the quality of their aerial photos. It is not motorized or remotely controllable, but allows better aerial stability, camera access, camera aiming, and camera protection. 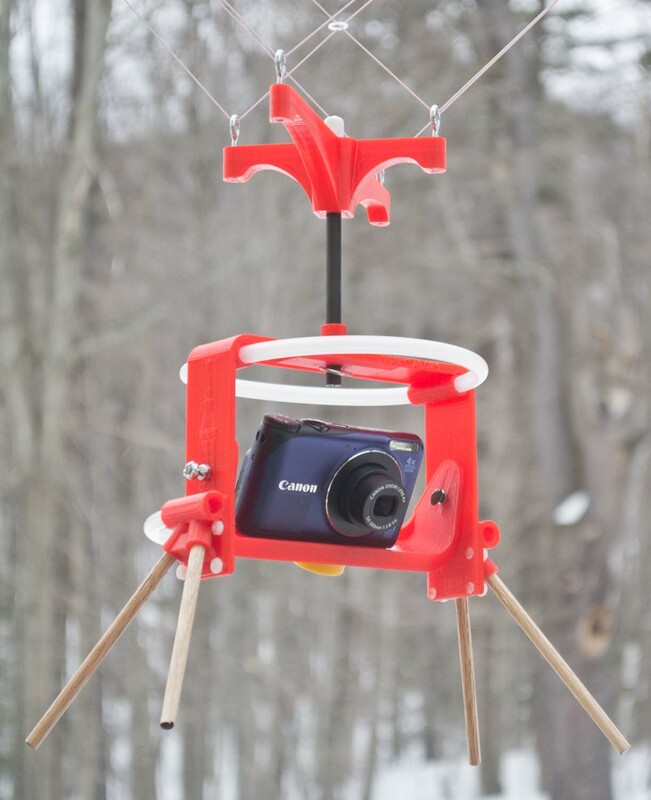 The articulated camera tray allows vertical shooting for mapping and also oblique photography with the camera balanced in either position. The camera is attached with a thumb screw into the tripod socket so it is always securely pointed in the same direction. 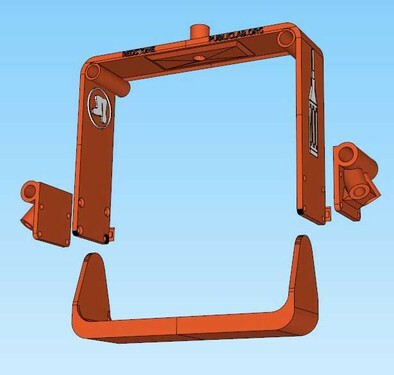 Protective legs and bumpers can be quickly configured in various ways for different needs. The rig can be easily suspended using either a pendulum or Picavet system, both of which prevent spinning and tend to keep the rig level (I also have new designs for a pendulum and a 3D printed Picavet that I will describe soon). The Redstone Rig easily attaches to a Picavet suspension, (design also available at Thingiverse). If you can print your own parts, the files are freely available at Thingiverse. I have made kits of the additional hardware for the Redstone Rig available for sale at my store (The KAPtery) so you don’t have to shop around for the odd bolts and tubes that work best. I am also making a small number of full kits with the 3D printed parts and required hardware available at the site. This new online store is just a free WordPress plugin, so it is a bit clunky to those of us accustomed to Amazon, but it might serve its purpose. I know it lets you put things in your shopping cart, but at this point I have not demonstrated that you can actually checkout and pay at PayPal. [Update: Thanks to Pat Coyle who completed the first purchase at the KAPtery after much persistence. I'm still having trouble making the shopping cart work with Internet Explorer, but IE seems to work for others.] So I would appreciate any feedback on your experience with the site. The plugin is not smart enough to know how much international shipping costs (and customs forms and exchange rates are not fun), so for now I can only ship in the US (but let me know if you REALLY want something elsewhere). The Public Lab boots on the Redstone Rig. This has been an exciting design/build project like none other I have done. I can't wait to hear that the rigs are flying somewhere. Hats off to Chris. The store is working. I've got the Redstone Rig and Picavet kit on order.